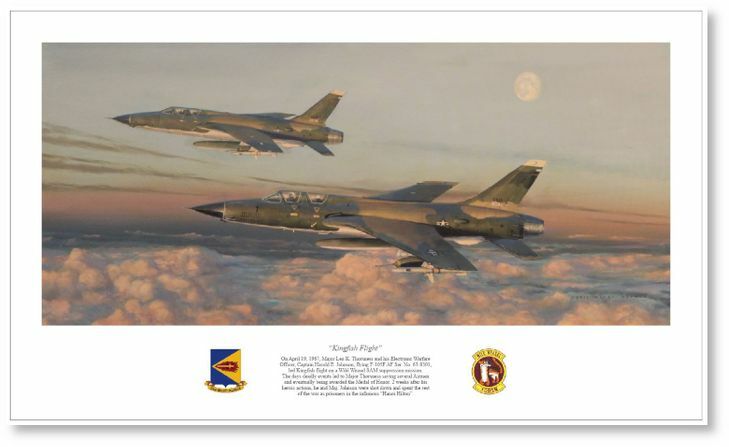 Overall size: 13" x 22"
Image size: 9" x 20"
On April 19, 1967, Major Leo K. Thorsness and his Electronic Warfare Officer, Captain Harold E. Johnson, flying F-105F AF Ser. No. 63- 8301, led Kingfish flight on a Wild Weasel SAM suppression mission. The days' deadly events led to Major Thorsness saving several Airmen and eventually being awarded the Medal of Honor. Two weeks after his heroic actions, he and Maj. Johnson were shot down and spent the rest of the war as prisoners in the infamous �Hanoi Hilton�.